With the plane still not found (if you said ‘what plane?’ I truly envy your ability to block out the world) and some people round the world celebrating the passing of Fred Phelps (I’m sorry for his family as he was someone’s son and I’m trying to be kind, but good riddance to all that hate), I thought there was no better way to ring in a Friday than with an inspirational story. Today’s comes from Los Angeles, by way of the Sudan. Mick Ebeling, the founder of a company called Not Impossible Labs helps build devices to assist people facing insurmountable physical challenges. After reading about a Sudanese boy in Time magazine named Daniel Omar, who lost both arms in a bomb blast (being a father himself to three boys) he found it hard to sit there and do nothing. Ebeling also understood the cruel reality that despite the fact that thousands are losing limbs in the Sudan from bomb blasts, fitting them with prosthetics is not a priority for humanitarian organizations as it can be a very costly venture. Ebeling and his company deemed the undertaking "Project Daniel," but the hard part would be locating him as Daniel lived in a remote and war torn part of South Sudan. There were also concerns that when they did locate him he would not be keen on the idea of receiving a prosthetic arm from some “tall, bald white dude,” as Ebeling described himself. At first a bit hermitic and shell shocked to say the least, Daniel warmed to the idea and soon enough was wearing this new fitted arm, and coming back into himself and the world. Ebeling describes Daniel’s transformation by this £60 device that takes several days to build as life changing. "Getting Daniel to feed himself was a highlight that was right up there with watching my kids being born." Ebeling’s other goal whilst in the Sudan was to share the 3D prosthetic building techniques with Dr. Tom Catena, who works as the only qualified amputator in the area. Soon enough, the idea caught fire and the community rallied around the hope that this new technique could bring. Before Ebeling even touched down back in Los Angeles, two new prosthetic arms had been built. 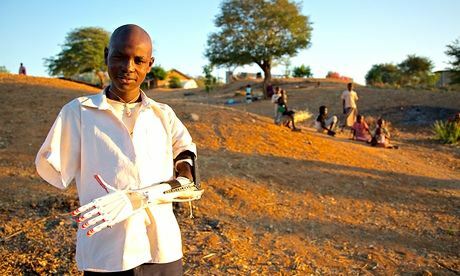 In fact, since Ebeling has returned home to the States, one prosthetic a week has been printed, thanks to two 3D printers he left behind and the training of the locals who are customising them for those in need. It’s stories like these that inspire us on many levels. Firstly, that there are people out the world like Ebeling who are not willing to just sit there and do nothing when they have the ability to change the lives of so many, and more importantly, that we realize that sometimes it does not take millions to change a life, but £60 and a few individuals eager to help those in need.